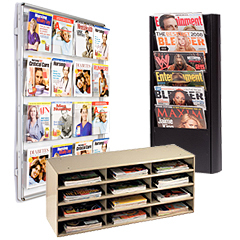 Brochure and magazine organizers are fabricated in many types of materials. Metal literature holders are the most rugged. The steel and aluminum displays withstand heavy use in high-traffic areas. 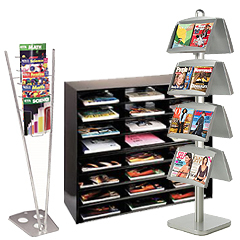 Designed for folded pamphlets and magazines, our metal literature holders are excellent choices for the business professional. Typical applications include reception areas, waiting rooms, and offices. 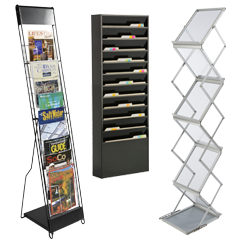 Display racks within easy reach to better distribute company information. For example, financial institutions need to provide mortgage and interest rates. Tourist offices and souvenir shops are great resources for advertising local attractions and tours. The applications are many! Most organizers feature fixed pockets. However, adjustable models offer customizable slots that accommodate different-sized ephemera. 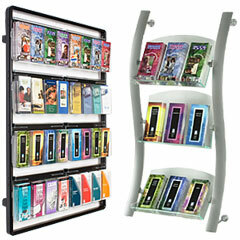 Display folded brochures, full-size catalogs, or combinations of the two. 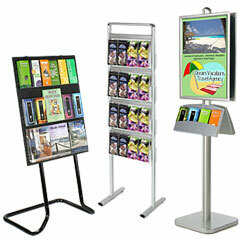 Floor stands with sign or poster frames add marketable punch to the presentation. Other models come in double-sided or spinning iterations. 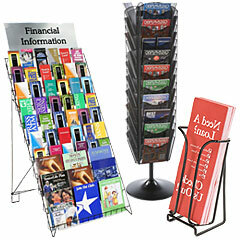 Featured in our best selling category are a select offering of our best collapsible metal literature holders. Set up and knockdown in seconds! Smaller applications require counter top racks. Display a single pamphlet on a desk or opt for 10 or more pockets in tiered designs. On the other hand, wall mount holders save floor and counter space. Whichever model you select, their steel or aluminum construction offers great value for the price. Once purchased, these durable and long-lasting products will provide years of service.